Cloth Diapering Tips and Tricks I've learned along the way! After a year and a half of cloth diapering, I've figured out a few tips and tricks to help you out! Rinse, rinse, rinse! Rinsing diapers before throwing them in the pail, especially nighttime diapers, can help keep ammonia at bay! Wash your diapers every 2-3 days. The longer they sit, the more time ammonia has time to develop. Use flushable liners when traveling. They will make cleaning off poopy diapers so much easier! Keep a spare diaper in your car. You never know when you'll need one! Prefolds and flats work great trifolded. No need for fancy folds or "pins". Microfiber can cause compression leaks! Use a natural fiber or add a doubler. Less is more! Start with less detergent and add a little more if you need to. More detergent can cause buildup or ammonia issues. What diapers work for your friend's baby, may not work your baby. Weight recommendations are not an exact size. Look at how the diaper fits on your baby to determine when to change the rise on one-sized diapers. Ammonia smells are from too much detergent. Barnyard smells are from not enough detergent. What tips and tricks have you figured out? 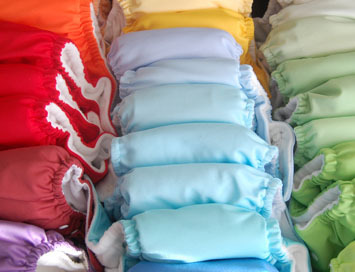 Start cloth diapering when YOU'RE ready!